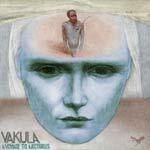 Ukranian music producer Vakula's next album, to be released on 17th November 2014, will be A Voyage to Arcturus. The six-sided album's song titles all refer to David Lindsay's novel, from "The Seance", "19 Hours Prior to Arcturus", and "Maskull's First Day on Tormance" on side 1, to "Barey" and "Muspel" on side 6. Released on Vakula's own label, Leleka, it can be ordered from Juno Records, which describes it as Deep House. In this article about the release, at Fact Magazine, it is described as "more like a soundtrack" and "cinematic music".